…and get $50 credit towards your membership! Here at Paramount Strength & Conditioning, we realize that “word of mouth” and referrals are our most powerful methods for generating new memberships. 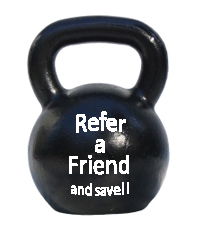 It Get’s Even Better: THIS IS NOT A ONE REP MAX REFERRAL CREDIT, IT’S AN AMRAP! That’s right, FOR EVERY ADDITIONAL REFERRAL THAT SIGNS UP, YOU GET ANOTHER $50 smackaroos! We know that our members are awesome people and LOVE CrossFit. We also know that our members can’t stop talking about CrossFit. Your friends, family, colleagues and acquaintances ALL know you do CrossFit, c’mon! Heck, they can see the results of your hard work and efforts. They know how toned and healthy you are getting and secretly want to be like you, so why not give them the opportunity and make some dough along the way? All you have to do is tell your friends, your co-workers, and your family about us! Referrals are easy. Just direct them to our website – paramountsc.com – and have them send us an email: getfit@paramountsc.com and ask them to mention you in the email and we’ll do the rest. You must be a member for at least three months and in good standing, in order to qualify for this offer. To ensure you get the referral credit you deserve, we will always ask those contacting us how they heard about us and let you know they contacted us. *First referrals must sign up for a minimum 3-month commitment, and fulfill that commitment. **Additional referrals must also sign up for a minimum 3-month commitment. ***If a cancellation or interruption of services occurs before their three months is up, we may reserve the right to remove the credit from your membership account. First and subsequent referrals are credited to the end of your existing Paramount membership commitment period. Best CrossFit Deal in north Seattle!